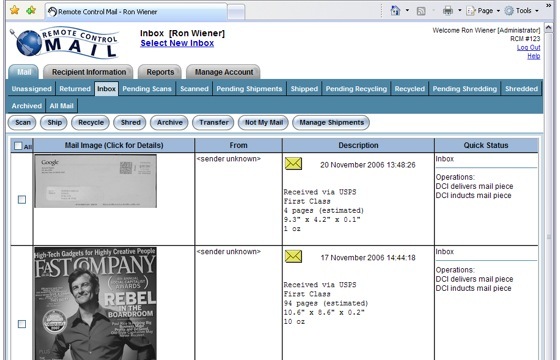 Kirkland, Washington based company Document Command Inc. has launched its consumer facing web interface for postal mail called Remote Control Mail. The service provides an alternative to PO Boxes, mail forwarding or waiting until you get home from the road to deal with your mail. The company receives your postal mail, scans the outside of what’s sent to you and provides a web interface to quickly sort through letters, bills, magazines and direct mailings. It looks like a lot of fun and very useful for some people. Though Remote Control Mail is targeted today towards niche users, that market size is not small and there are plans to extend related services to far more users. Document Command is working on a full scale robotics system that will provide even more functionality to institutions and mail customers in general. Users of the service are able to quickly view the front of anything sent to them and choose between having the items shredded, recycled, archived, opened and scanned or forwarded to wherever they are in the physical world. Future features may include the ability to deposit checks to your bank account and automatically apply signatures to documents with just a few clicks. Remote Control Mail is now available for personal users for an activation fee of $25 and monthly rates starting at $19.95 per month for up to 5 named mail recipients. Business plans are also available. Customers provide a Remote Control Mail address to anyone sending them mail and the company will forward selected mail wherever you request. Where legally permitted, the company will also forward to international addresses. Through early testing the company has been able to determine behavioral statistics for postal mail customers with unprecedented detail. The company has found that 30% of incoming envelopes are ordered to be opened and scanned. After being scanned, 13% of recipients asked that the original mail piece be forwarded to them, 53% had the piece recycled and 34% had it shredded. Those are the kind of aggregate statistics that businesses in many industries will probably pay for and could help things like direct mailings become more targeted and less annoying. Some consumers will no doubt have privacy concerns, but those concerns don’t seem atypical to me relative to what any direct service provider faces. Document Command has an executive team strong in engineering, robotics and postal services. Though Remote Control Mail is far from fully automated today, the company is working on large scale automation of the processes and intends to cut postal labor costs around the world substantially. The video on the left is a short CAD clip demonstrating the mass sorting Document Command is aiming at. When you watch the video, see how it feels to say out loud “Robot, please forward me those important letters!”From rural postal customers to road warriors to touring rock stars, I can imagine that Remote Control Mail would be a compelling product for many people. If I was a rock star, I’d want to sort my mail like a rock star too. This is exactly the kind of web service that I foresee proving to be a viable business in the near future: the web is becoming a basic utility for any number of everyday practices. Services like this may well help older institutions keep up with the times, too.